Junko Kitanaka’s book richly deserves the superlatives that reviews other than this one will be sending in its direction. A fruitful combination of medical history, ethnography and sociology, Kitanaka guides us with an expert knowledge and lucid style through the complexities of Japanese depression as it is now and as it was in the past. Thus it stands to be of interest both to historians of medicine who work in early modern periods and those who are concerned with the present and how psychiatry moves forward in our own time. Kitanaka has had plenty of experience with Western psychiatry from her time in North America, and provides something of a comparative study (although this is by no means the stated aim of the book) of the way Japanese and Western cultures of psychiatry have converged and diverged. The book is never less than fascinating and should be read by any historian of psychiatry, or indeed anyone interested in the history of depression. The book is divided into three main parts: depression in history (an excellent short history with cross-cultural applications), in clinical practice, and in society. The first part deals with the progress of depression from ‘the premodern language of depression’, ‘the expansion of psychiatry into everyday life’, the debate in the early twentieth century about neurasthenia as a disorder of overwork or defective (‘weak’) personality, and finally to the point at which ‘the current medicalization of depression’ has not necessarily resulted in the same potentially reductive biochemical emphasis so prevalent in the West, particularly the United States (67). Instead, Japanese psychiatrists have annexed the idea of depression as a disease of the whole person, a ‘Typus Melancholicus’, who is prone to depression because he (we will return to gender later) is too hard-working and has over-internalized the Japanese ethic of productivity and corporate loyalty. Depression thus becomes a disease of fatigue, but to be treated in pharmaceutical manner rather than via the social structures that determine this discourse of work. The second part examines how depression has been dealt with at the coal face of clinical practice, for psychiatrists as well as patients. It is a great strength of this book that it combines history with ethnography, so that this part is ‘based on two years of ethnographic fieldwork I conducted at three psychiatric institutions (a university hospital, a private mental hospital, and a small clinic specializing in psychosomatic medicine)’ (85). A working knowledge of real-world interactions between patients and their psychiatrists gives the book a practical and authentic insight. The first chapter in this section demonstrates how psychotherapy for depression has been a ‘taboo’ treatment for Japanese patients, and how psychiatrists have actively avoided wandering into the realm of the patient’s subjectivity and possibilities for self-analysis and reflexivity. Rather, they have concentrated on providing biological and social explanations for depression, partly motivated by a fear of ‘colonizing’ the patient and – to mix the metaphor- unleashing psychological forces that the ‘lid’ of biomedical explanations had kept under control (104). The next chapter deals with the limits of this method, and in particular the case of suicide, which is usually regarded in Japan as an act of free well and a ‘moral act’. The explanations provided by Japanese psychiatrists conflict with this self-determinism as they strip away that very aspect of suicide that seems most to figure individual agency. These tensions are apparent when patients are not persuaded by the psychiatric discourse of passive determination by outside forces, whether social or physical. 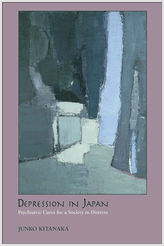 The final chapter in this section challenges the Western conception of depression as a ‘female malady’ (although of course this is only a particular representation of gendered depression as recent work on both depression and hysteria has demonstrated) and shows Japanese depression to be regarded as a disease of both sexes, but with the twist that representations of male depression are structured by a public discourse of depression ‘that highlights their sense of fatigue and overwork as well as the injustice of economic and social systems’ (86). Female depression often resists the ‘paternalistic’ relationship with the psychiatrist (are they all men?) that smooths the male road to recovery because women ‘rarely seem to link their suffering to the recognized structural causes of depression’. The way women manifest their resistance to the encouraged dependency on the psychiatrist is to switch the particular practitioner until they find the ‘right’ one. This is a situation that is starting to change, argues Kitanaka, as the gender politics of Japanese society shifts, and as the neoliberal imperative of modern Japan stimulates the individual to take control of her or his destiny rather than ceding power to the psychiatrist. The last part of the book (III) moves beyond the asylum and into the wider social realm, where psychiatry is employed as a means of representing and critiquing the ills of that realm. The first chapter uses Rabinow’s concept of ‘bio-sociality’ –in which a patient can empower him or herself via medical label or diagnosis, despite a lack of power in the social sphere – to analyse the status of overwork suicide and depression in Japan. Kitanaka shows that psychiatrists ‘have become engaged in a social movement against overwork that has brought doctors, lawyers, and depressed workers and their families together’ (153). The fact that workers have managed to win legal battles that argue for overwork depression and suicide brings psychiatric discourse firmly into the public realm, but with this transition comes a series of conflicts that need to be negotiated. If a willing worker commits suicide from overwork, where does that leave the traditional Japanese work ethic? Similarly, within medical discourse itself, what do doctors do when they intrude into the moral rather than scientific arguments about the causes of depression in Japanese workers? The following chapter (10) examines the way in which medicalization over the course of a decade has had effects in law and policy, public debates about antidepressants, and industrial management. This again uses fieldwork conducted in 2008/9, and is the better for it. Medicalization, it transpires, has not been straightforward, and has involved the medical community in the demand from government and industry to find a scientific way of managing depressed workers. Different groups (medics, lawyers, managers) have different perspectives on the nature of depression and the depressed person, including their susceptibility to work stress, and stress’s connection to depression. Finding the best way of dealing with work-related depression is a political hot potato, not merely a medical issue. Kitanaka concludes the book by connecting the local issues of Japanese medicalization with global politics. The result chimes with the Western emphasis on drugs: ‘Despite the seemingly redemptive role it has played in Japan, however, psychiatry continues to be characterized by a dual structure: while providing a socializing language that has helped popularize depression, psychiatry retains its biological principles at the core of its practice. Without fundamentally altering the way it operates-or generating a new theoretical and clinical framework to address the social nature of people’s “depression”-psychiatry has relegated the depressed to the pharmaceutical management 0f everyday distress’ (193). This ‘aggressive pharmaceuticalization’ promoted by Japanese psychiatry ditches the psychological and social aspects of depression, at least in terms of treatment. Needless to say, this focus on the biological is not generally a positive outcome for the suffering patient. The future of Japanese depression goes in some ways in tandem with Western depression: both cultures need to move beyond the crudely pharmaceutical and to address the social and psychological structures that (albeit differentially) affect both types of (late?) industrial societies. This review hardly does justice to the depth of scholarship (both historical and ethnographic) and complex yet lucid arguments that constitute Kitanaka’s brilliant book. This is the first place one should look to gain an understanding of Japanese depression, contemporary and historical, and, what is at least as rewarding, should be taken as a model of what cultural and ethnographic research can achieve when conducted at this level of excellence. Clark Lawlor teaches at the University of Northumbria, UK. He is the author of several works, including most recently, From Melancholia to Prozac: A History of Depression (Oxford 2012).